Ford India is a motor company in India which is celebrating Interim budget with reduced excise duty on its vehicles which is upto 1.07 lakh on various models. Ford India comes with an Easy Exchange Offer on its Figo. Ford is now celebrating the cut in excise duty by presenting an exciting offer on its all models of Figo. Figo is 1196cc Petrol and 1399cc diesel engine car gives mileage upto 20.0 KMPL. Offer infest on the exchange of old cars. Offer will definitely enamour you by bestowing with exchange bonus upto Rs. 10,000 and free insurance. Ford avails you accessories of Rs. 8000 on its Figo models. Offer exists with zero processing fees. 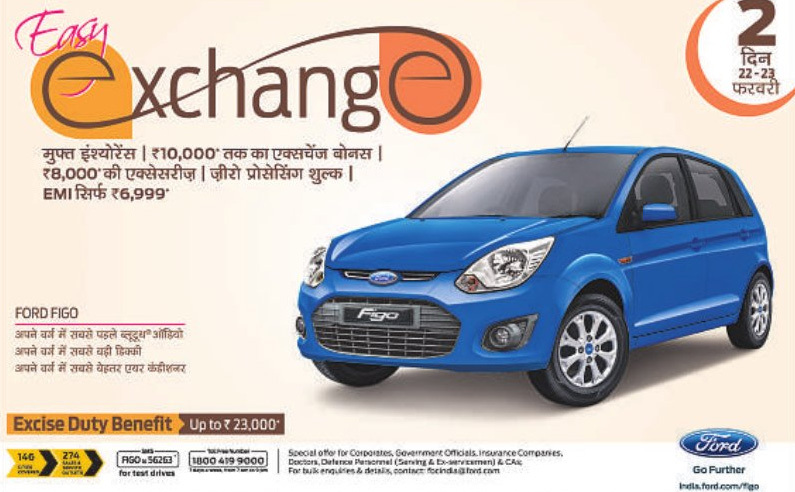 Ford is proposing you a stimulant offer to exchange your old car with new Figo car on monthly EMI of Rs. 6,999 only. Ford confers you with Excise Duty benefit upto Rs. 23,000. Offer is valid on all models of Figo cars. Offer is in effect for 2 days from February 22 to February 23, 2014. Currently Ford is selling Figo, Classic, Ecosport, Endeavour and Fiesta. I have a Ford Figo diesel variant model 2014. I want to exchange it in company showroom. The vehicle has run almost 53000 km till now. How much amount can I get in return if I offer an exchange to buy a new Ford vehicle. Kindly contact me on 9044161212.